The success in life is based largely on how a person gets along with others, how he affects others and how he reacts to others. Maintaining good relationship with family members, friends, official members, business friends, and customers is the key to success, well-being, welfare, peace, happiness, prosperity, et cetera. With effective speaking, you can achieve these things in shaa Allah. If our intention is to live a peaceful and happy life in this world, we will have to learn how to speak effectively. Words are generated by our thoughts and emotions. The type of thoughts we feed and cherish in our mind, and the type of emotions we employ, are the type of words we deliver from our mouth. Therefore, to switch off harmful thoughts and emotions and to switch on beneficial thoughts and emotions, we need to analyze and make changes in our thought patterns. Emotions play a very important role in the conversation. If the same words were delivered with different emotions, they bear different results – for instance: the sentence, ‘I can’t meet you, today’ delivered with the emotion of love affect addressee differently from the effect produced by the same words delivered with the emotion of anger. So it is necessary to utilize right emotions in the conversation and greet others with a smile. Although in the age of telecommunication, it’s not difficult for an effective conversation to take place without facial expressions – it’s about emotions and not necessarily facial expressions (so if you are a niqabi, don’t think you can’t communicate effectively – the tone of your voice delivers your expression well). Words can conquer the world or destroy it. With your words, you can bring a smile on your own and others’ faces, you can bring tears to your own and others eyes, you can help yourself and others become happy, you can make yourself and others sad, you can make yourself and others angry if Allah wills. So, one must work hard to be able to use the right words with respect to time, circumstances and mentality of an addressee. 1) Is it قَوْلًا كَرِيمًا (A Noble Word)? The triliteral root of the word كَرِيمًا is kāf rā mīm (ك ر م) which means to be generous, precious, valuable, honorable, noble etc. 2) Is it قَوْلًا سَدِيدًا (A Word of appropriate justice/ A True word)? The triliteral root of the word سَدِيدًا is sīn dāl dāl (س د د) which means to be straight to the point, hit the right point, speak or act rightly, be well directed, right thing, true, just etc. 3) Is it قَوْلًا لَّيِّنًا (A Gentle Word)? The triliteral root of the word لَّيِّنًا is lām yā nūn (ل ي ن) which means to soften, make tender, lenient, smooth, to make pliable etc. 4) Is it قَوْلًا مَّيْسُورًا (An Easy Word)? The triliteral root of the word مَّيْسُورًا is yā sīn rā (ي س ر) which means easy, manageable etc. 5) Is it قَوْلًا مَّعْرُوفًا (A Beneficent Word)? The triliteral root of the word مَّعْرُوفًا is ‘ayn rā fā (ع ر ف) which means something known, recognized or acknowledged (commonly). When you stick to this rule, you will avoid back-biting, abusing, blaming, arguing, hurting, accusing, etc. – avoiding a lot of sins as a result in shaa Allaah. Therefore, at the time of difficult situation – when you don’t know what to say, simply stay silent. 6) Is it قَوْلًا بَلِيغًا (An Effective Word)? The triliteral root of the word بَلِيغًا is bā lām ghayn (ب ل غ) which means far-reaching, attaining, to fulfill a task, come to an age or come to a point. When you are speaking, try maintaining the suitable pace and volume. A person’s way of speaking shows the growth and maturity of his mind. Respect the age, relationship, position, time and mood of the addressee. If you deliver even the truth at the wrong time, you may not get the desired effective result. Hand shaking is only applied to individuals of the same-gender. It signifies how you give importance to the other person and how receptive and attentive you are towards them. Put your phone aside and be present physically and mentally to assess the conversation properly – be it children, your spouse, parents or even strangers – your ‘presence’ is essential for the communication to be effective in shaa Allah. 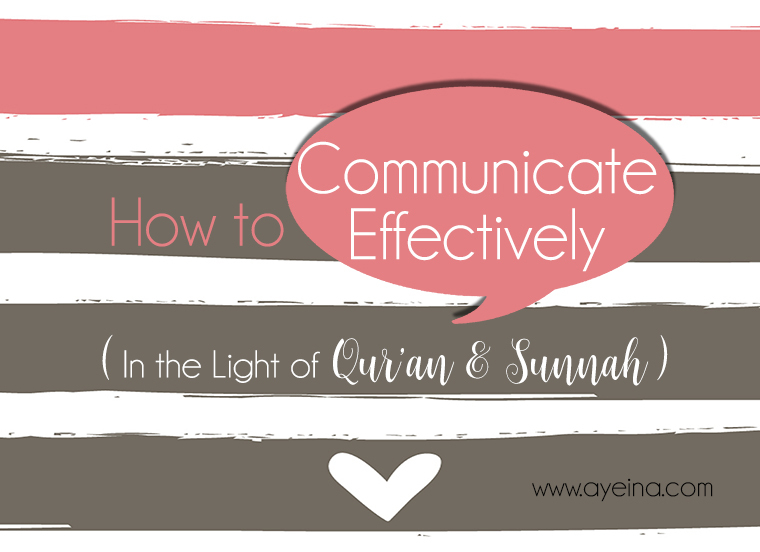 May Allah help us preserve our relationships through the beautiful teachings of effective communication. The hadith that said that a word can take us to jannah or jahanna, really scared me. May Allah help us in gurading our tongues. May we follow and implement all the above tips. Sins of the to gue are taken way too lightly. Thank u for this reminder. JazakAllah khair. This is such a well written and thoroughly researched piece. MashaAllah. Hats off to the author. …we often forget even the site pest acts of effective speakong are actually outlined in the Queen. Or we overlook it. Each & every word is so important,I mean we should know what Effective speaking is & then apply it in our lives. Person should be able to speak well & that’s what Islam teaches us too. Putting your phone aside is SO important to show respect to those you are communicating with. It is becoming more and more common to stare at the screen and I find it so rude! Assalamu Allaikum, what a very good reminder which enhances good reletionship of muslims and Islam as a complete way of life. Wa Alaikum Assalam Wa Rahamatullahi Wa Barakatahu, Alhamdulillah the tips are well presented, needs to put into practice in full.